People often confuse a "raw diet" with an "all meat diet", based on the assumption that a dog's natural raw diet is also a meat only diet. The truth is that dogs cannot survive on a diet of meat alone. 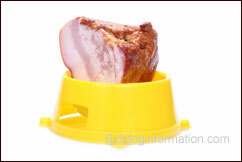 They are omnivores and meat should form only a part of their over-all diet, whether raw, processed or cooked. In the wild, canids eat not only the meat but also the bones (rich in calcium), the organs, and the stomach and intestines (with their contents) of their preys. The stomach and intestines' content are mostly composed of vegetable material, as the wild dogs' kills consist almost entirely of herbivores (plant eating animals). Consequently, a meat only diet is highly unnatural and unbalanced. It is low in iodine, vitamins A and B1 and calcium, and has an imbalance of calcium to phosphorous, which can affect bone and teeth growth. The "all meat disease syndrome", described in scientific studies, shows that animals fed meat alone (without the addition of vitamins and minerals) develop soft bones, general poor condition and sometimes die. An all meat diet is also too rich in protein and fat. Excess protein isn't good for any dog breed, but bulldogs, in particular can't tolerate high-protein foods, which can cause "hot spots". The BARF (developed by Ian Billinghurst) and raw meaty bones diets (by Tom Lonsdale), in fact, recommend to include bone (never cooked bones ! ), eggs, fruits and raw vegetables, yogurt or kefir, and other natural foods to achieve a balanced raw diet. This be said, brachycephalic breeds such as bulldogs or pugs have jaws and teeth conditions that are not compatible with a raw food and bones diet. If you decide to feed your dog a BARF or raw meaty bones diet anyway, we recommend you do some reading and research (see the books on the right and references posted at the end of this article). Although a balanced raw diet may be the most natural diet for a dog, still it makes your dog more prone to ingest bacteria or parasites such as Salmonella, E.coli and Ecchinococcus. Great care should therefore be taken with hygiene to prevent diseases and infections. a Raw or All Meat Diet ? Bulldog Information 2003-2010 © All rights reserved.